The Book of Common Prayer is our guide to worship and devotion used in our daily relationship with God. The Book of Common Prayer can be complicated even for life-long Episcopalians and can seem even more bewildering for visitors and newcomers. Although this is brief, we hope to answer some of the questions you may have and make worship in the Episcopal tradition easier for you. Our current Book of Common Prayer, revised in 1979, was originally compiled by the Archbishop of Canterbury, Thomas Cranmer, in 1549. There are more than 80 million Anglicans (Episcopalians) in 163 countries throughout the world, using the Book of Common Prayer in their own language, reflecting our diversity and ethnic backgrounds. 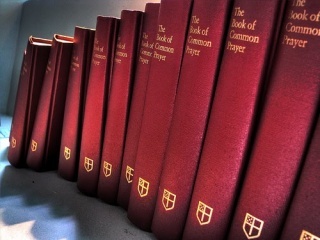 The Book of Common Prayer is a collection of ancient and modern prayers and worship occasions for times when the community gathers and for individual use as well. Many say that the prayers in the Prayer Book give voice to the prayers their hearts always wanted to pray, but could never give voice to. The Prayer Book reminds us to pray for those we might otherwise forget: those in prison, those whose faith is known to God alone, all sorts and conditions of people in all parts of the world. It allows everyone to participate, reminding us that each person is an important part of the worship experience, whether the service is a celebration or a solemn occasion. It is a guidebook for daily Christian living. Why call it "Common Prayer"? Common does not mean ordinary but “available” to the common person. These are the prayers we say together or “in common” when we worship as a community. Does it relate to the Bible? The primary service is the presentation of our Lord’s last supper with his disciples, a service we call the Holy Eucharist. However, the first experience many visitors have with the Book of Common Prayer is at weddings, baptisms or funerals in the Episcopal Church. Can it be used in personal devotions? Yes, in private daily prayers or with family, prayers in the morning and evening, special prayers of praise or thanksgiving, requests for others and for special occasions. All 150 psalms, or poems from the Old Testament, are contained in the Book of Common Prayer and can be read at any time. A calendar for reading through the entire Bible every two years, as well as an outline of the Episcopal faith and Church history is also included. Can I make up my own prayers? The Book of Common Prayer is meant to complement daily individual prayers, not to replace them. Every service in the book includes time for personal prayer requests, either silent or aloud. The Book of Common Prayer has been a source of comfort, joy and inspiration, a unique treasure in Christian worship for more than 400 years.